I love love LOVE snow! But I think my love for snow stems from growing up on the dairy farm. A snow day flat out meant it was time to hook up the toboggan behind the tractor, with Dad towing us for rounds around our large circular driveway. Or… when the power went out due to a big ice storm. We’d huddle around the kitchen table illuminated with candles, wearing jackets, playing board games. What’s not to love about those kinds of memories? So… this festive little sign brainstorm became all about where to find the nearest tractor towed toboggan during a wintery snow fall! Disclosure: Fusion supplied me with the paint. But as always, I love endorsing it because it’s fab! 1. 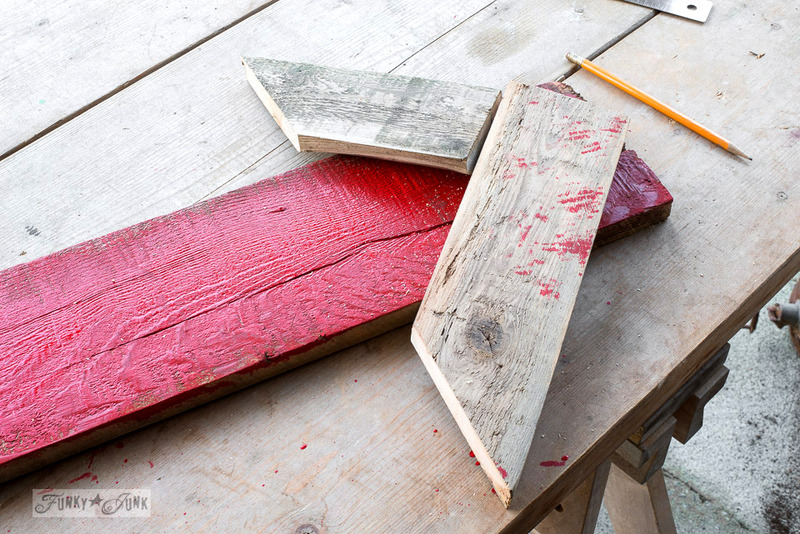 Paint the main plank red. I used a ‘sloppy technique’, not entirely covering the board to the edges. But I did apply two coats in the middle of the board for more colour coverage. 2. Create the arrow tip, then screw onto the main board. Cut one board straight at one end, and at 45 degrees on the other. Line up another board against the first, then centre the arrow tip as shown. Measure the 2nd board, including the first, to the same length as the first, as shown. Cut the new measurement at 45 degrees. Lightly sand the cut edges. Screw boards onto main sign board. 3. Position the stencil in the centre of the sign board, then tape into place with masking tape. 4. 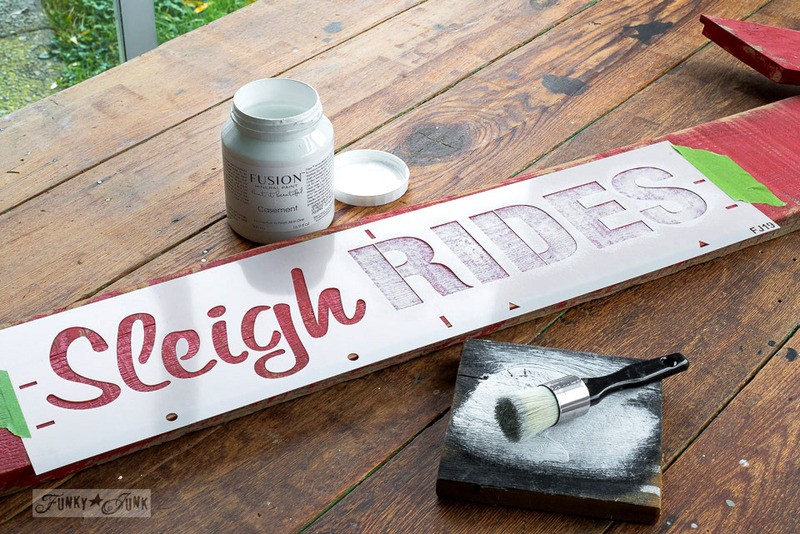 Using a very dry brush, tap the paint inside the letters. The tapping will give the letters a snow like appearance! 5. Stencil snowflakes in random placements. Tip: Have some flakes not completely fit the board, so they appear to have more of a drifting by effect. 6. 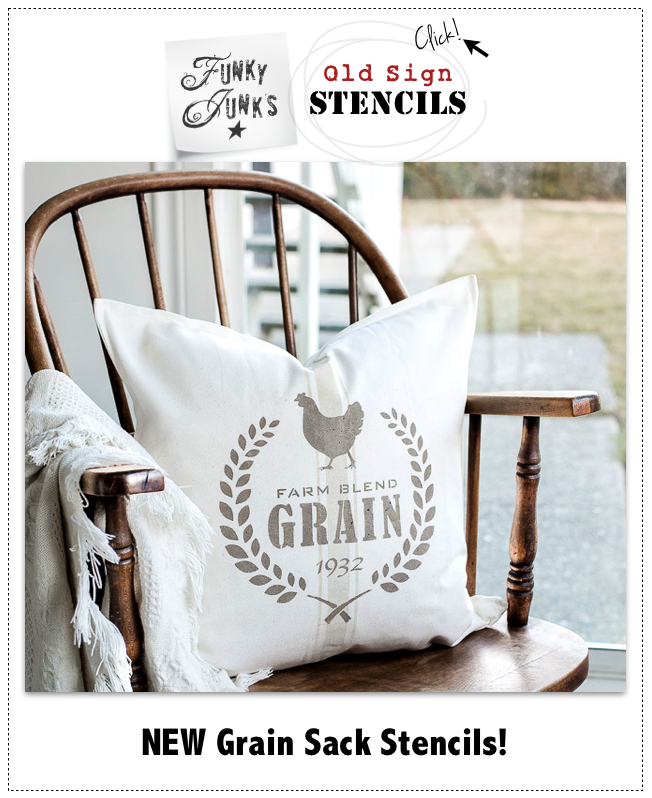 Sand the painted graphics if you desire a distressed look. Soooo festive, with snow flake fun! Really glad the arrow tip came into play. It is such an easy add, and dramatically changes the look and function of a plain board. You could use this sign to hang Christmas cards, used as a entryway coat rack, hang stockings, towels in a festive bathroom… you name it. But this round, this little vignette tells the story of the blustery snowfall that led to way too much fun. Then don’t forget to warm up by the fire! 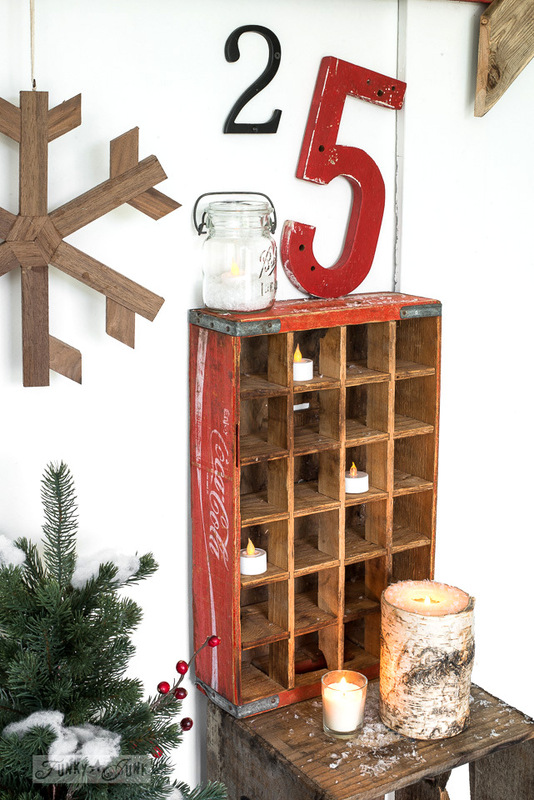 A vintage coke crate worked perfectly as a rustic cubby for battery operated candles. The snow on the tree is sewing batting. It looks real from a short distance! 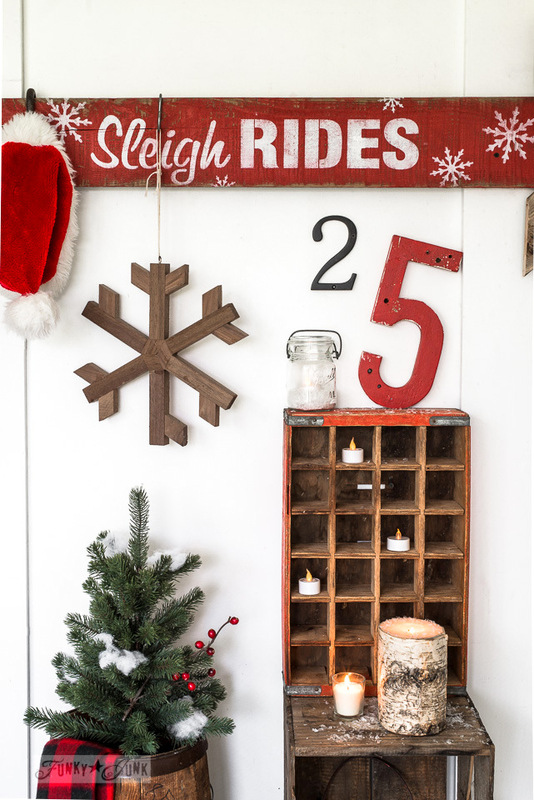 This little reclaimed wood Christmas Sleigh Rides arrow sign makes me want to find the next toboggan ride! Tip: Always sit in the back though. Those tractor wheels really know how to throw snow! Got any fav wintery tales to tell of your own? 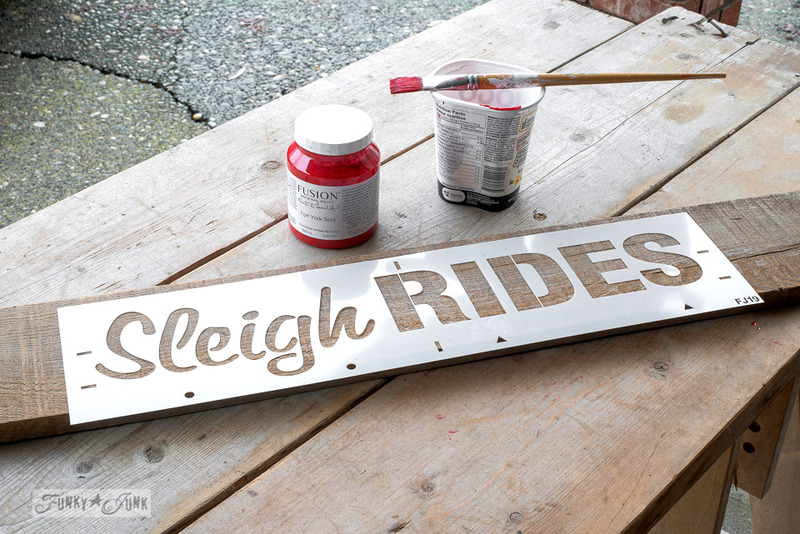 And here’s the Christmas card holder Sleigh Rides sign I made last year. 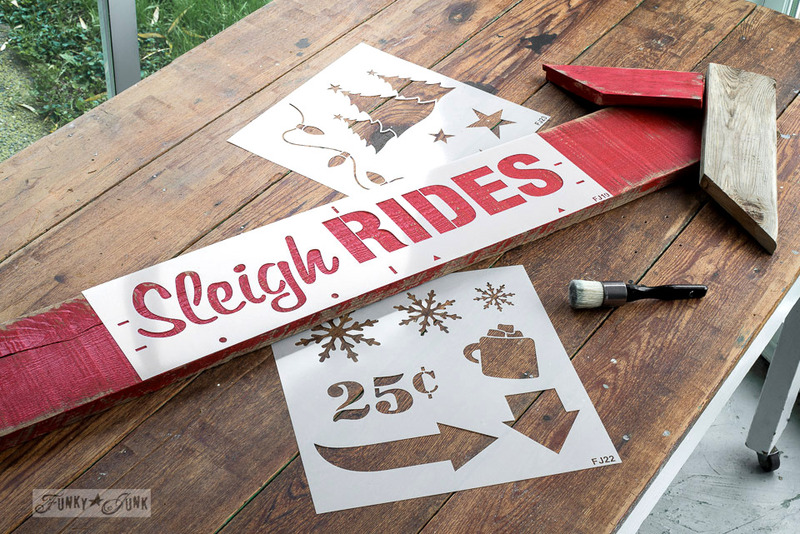 You can find the Sleigh Rides stencil HERE. 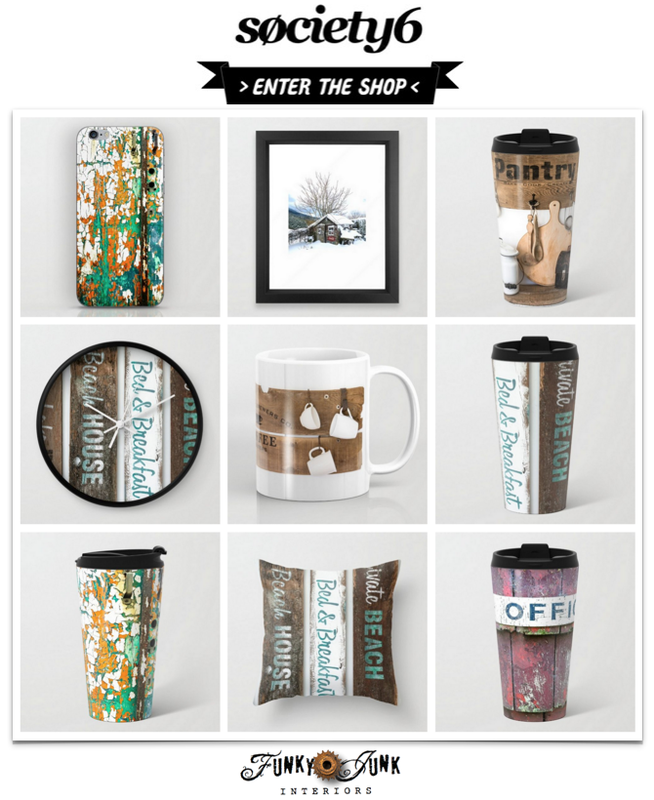 Or find a local retailer HERE. 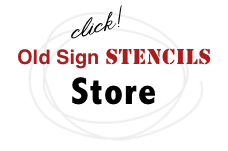 More Old Sign Stencil projects are HERE. Loving that pop of red, D! Beautiful!! 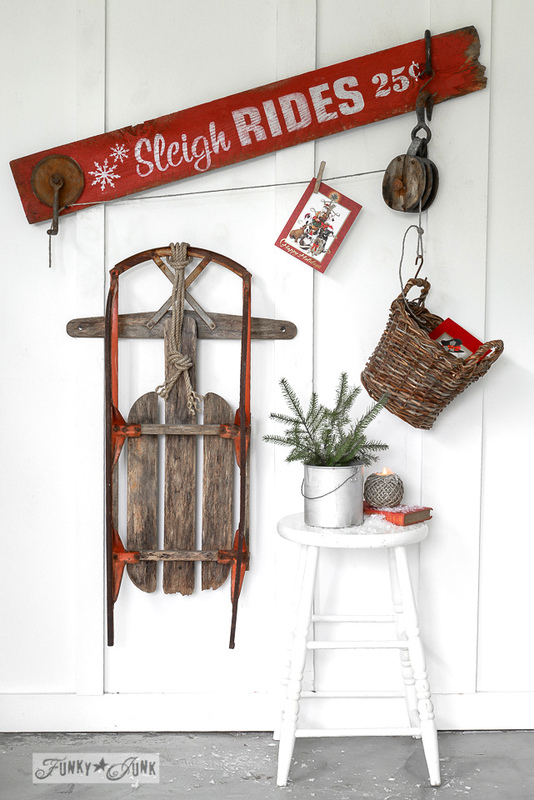 I have a sleigh I use for hanging my pots and pans from.. Love your idea. Love the arrow too. Have a great week..
Those rides behind the tractor sound like a blast, I’m not much for the cold anymore but do have some pretty fun memories playing in the snow as a kid growing up in WA state. Had this wooden sled and it added so much fun to a snowy day. 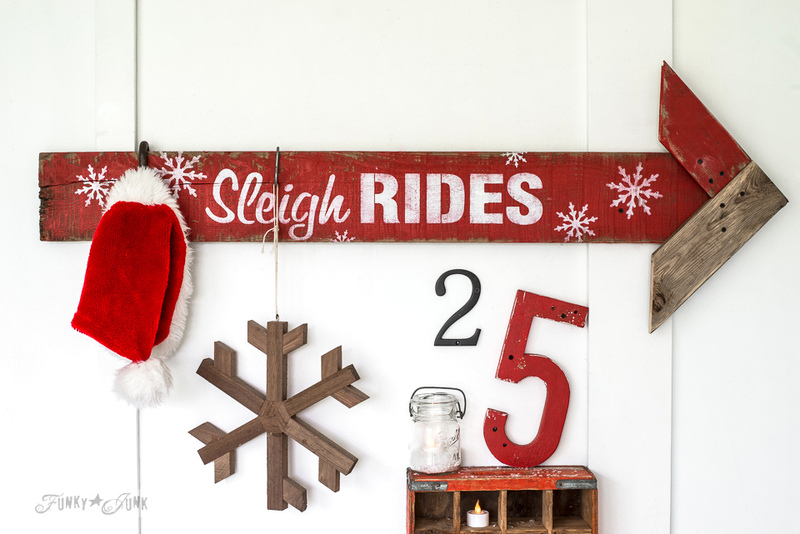 Love the sign, I’m adding the sleigh stencil to my collection next year. 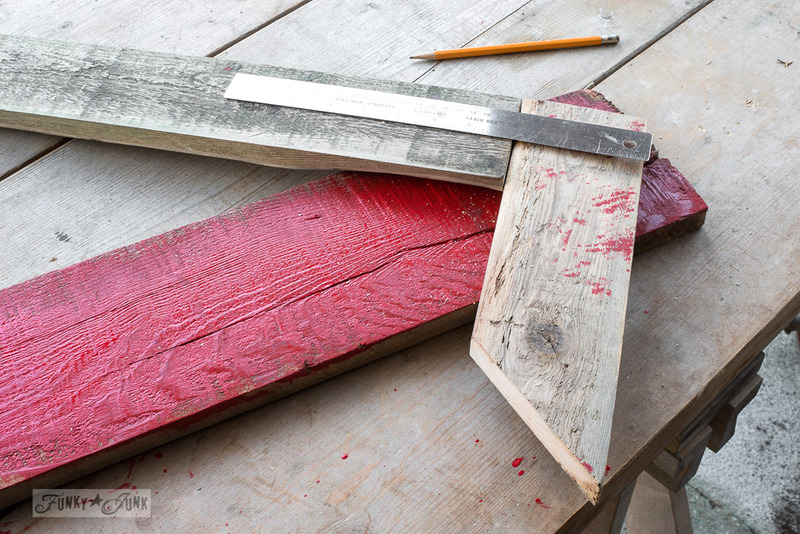 arrow love…and that red is perfect! Lot’s of snow memories…I’m not much for cold anymore. I like it if I can stay home and sit in my comfy chair with a book and coffee. Love, love this!!! Merry Christmas to you and your family!!! Love your wintery display. So many childhood memories to relive. Love the snow also, but not in it. Love your sleigh rides signs. Just enough red and sweet snowflakes to embelish. You have a great eye for arranging. 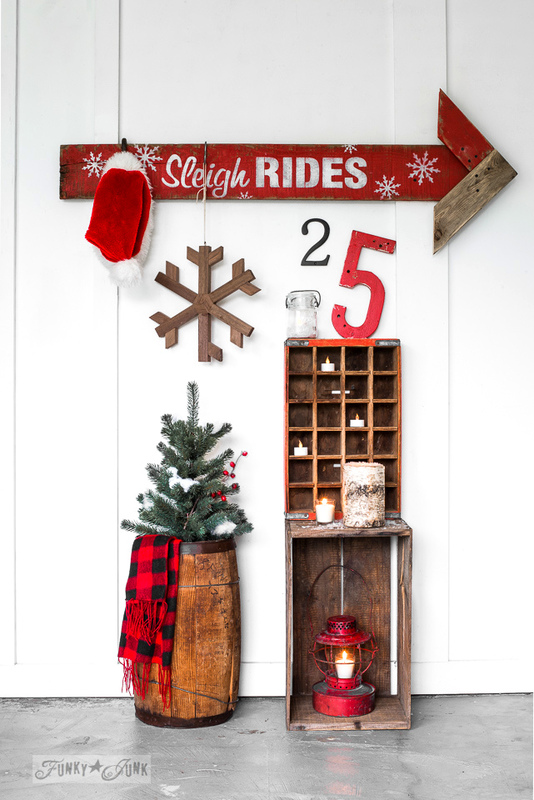 Both vignettes are as sweet as can be! It’s looks great, Donna! Can I come over to your house for some Christmas spirit? I’ll bring hot apple cider. 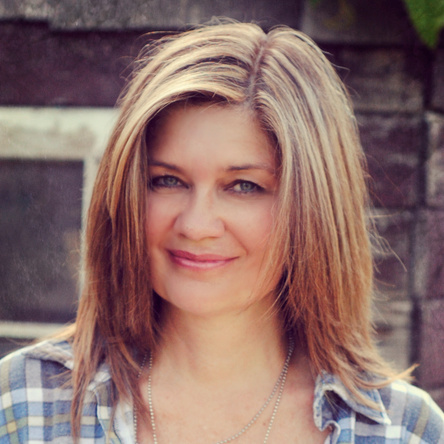 Just beautiful, Donna! I love the displays! Great signs!